One of the most popular and reliable trucks out there is none other than the Toyota Tacoma. This truck reigns as one of the top rated trucks on the market, with its affordable price tag, steadfast reliability, and incredible resale value. Because of this, many Toyota Tacoma owners use their trucks as both daily driver and as a utility vehicle. It’s not uncommon to see the same Toyota Tacoma cruising on the streets and then hauling some heavy duty cargo. 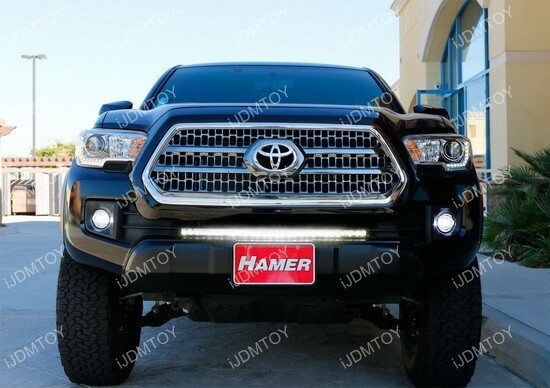 This is a 30" lower bumper Toyota Tacoma LED Light Bar with spot beam pattern that greatly increases the lighting output and functionality of the truck. This product comes with special adapters so that it is compatible with any car that can use the LED Fog Light with H11 bulbs, making the compatibility list even larger. You can see that the LED halo rings give the car a little bit more of a unique look as opposed to the standard fog lights. This makes it perfect for the person who likes to think outside of the box but doesn’t want anything too crazy. You can even see the quality of the glass projector and the smooth, clean look.